Big apologies to Chewy for not posting this in April. Shiver and Chico settled on the Chicken Soup for the Soul Dog Treats. I had a big influence on the decision since I love the Chicken Soup books, but they made the ultimate decision. Our box came with a pamphlet this time, detailing lots of their other pet goodies. The only drawback is that it didn't list any prices. These treats are all-natural and made with real chicken. They contain no soy, wheat, so, or artificial flavors. Best of all, they're made in the U.S., so you can be sure the ingredients are safe. 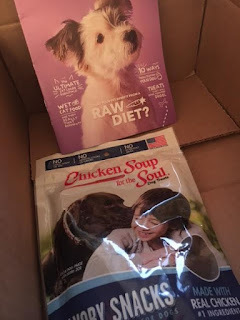 Chicken Soup for the Soul supports adoption programs and shelters across the country, and features rescues and their owners on their bags. How cool is that? They also believe that mealtimes are bonding times, and I completely agree. Aren't these cute? They're soft, chewy, and full of flavor. The boys LOVE them! 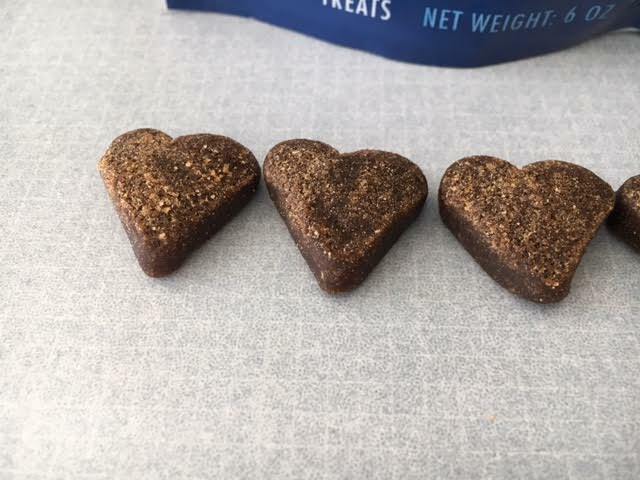 Each heart shaped piece is only 8 calories so I can feel good knowing they're getting a healthy treat. A 6 ounce bag is only $4.99, which is very reasonable. Don't like chicken? No problem, Chicken Soup for the Soul offers several other varieties! They also offer 15 and 30 pound bags of dog food. Shiver and Chico give this eight paws up.